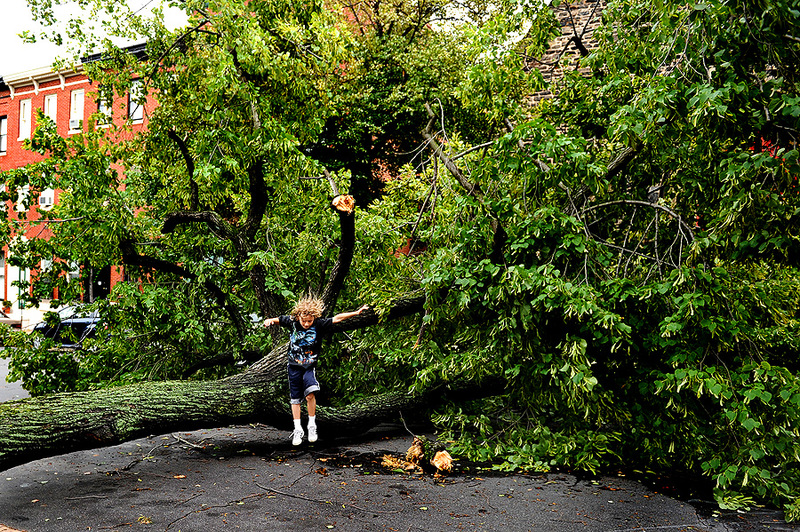 "Evan Cunningha, 9, uses a down tree as a playground as Maryland deals with the after-effects Of Hurricane Irene on August 28, 2011 in Baltimore, Maryland, United States." The New York Times reported Hurricane Irene as a storm that "will most likely prove to be one of the 10 costliest catastrophes in the nation’s history." While that may very well be true, Baltimore thankfully didn't suffer much damage. No real flooding, but lots of high powered wind that left many without power. I was originally assigned to head to Ocean City, Md., to cover the storm. Then my schedule changed and a mandatory evacuation had us changing plans and send someone in sooner. So while I was out in the storm shooting lacrosse Saturday, I got the note to head to Annapolis on Sunday morning. However, by the time I was walking out the door, it was evident that the storm spared Annapolis and Baltimore, but I still was sent out to cover Baltimore City. All my rain gear and extra clothes were a waste as it never even rained on Sunday in the city. I drove around for a couple hours and photographed a lot of downed trees. Hopefully my coverage gave Baltimore a voice in a rather dull storm in the city.